Yes, the launch of the iPad mini is still just a rumour. But the Wall Street Journal (no slouch in the journalism game) is justthe latest media outlet to report that a smaller iPad will beintroduced by Apple later this month. Today’s WSJ report seems to lendan awful lot more weight to the probability that some form of lighter,thinner iPad is coming down the pike from Cupertino. Here, we sort through all the buzz to boil down the latest about theiPad mini, courtesy of our source story from Huffington Post. Will the most recent iPad (above)soon spawn a tinier version of itself? Who: BesidesWSJ, it’s also been reported by AllThingsD and a Japaneseblog called Macotakara. HuffPost says WSJ and AllThingsD, which aresister media outlets, have a track record of close ties with Appleand/or correctly predicting big news out of the company before ithappens. What: Thenew device will reportedly sport a 7.85-inch screen and bepriced lower than the $499 iPad. Where: Itall seems to flow back to China. To bolster its story today,WSJ cites confirmation from Chinese manufacturers that they are alreadyproducing the iPad minis at their factories. When:Depends on who you ask. Some sources say as early as Oct. 10(seriously?) or as late as sometime in November. Naysayers argue thatApple will wait longer because it just launched iPhone 5 and iOS 6 andis still smarting from the bad reviews for its mapping feature. 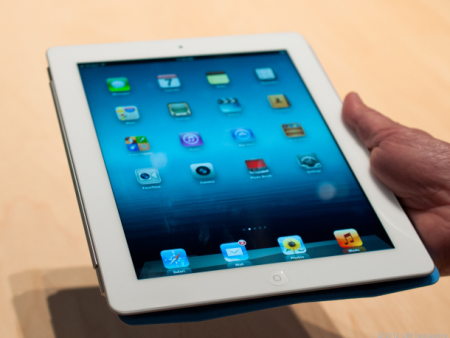 Thebullish view sees Apple eager to release iPad mini soon to takeadvantage of the holiday retail season. Why: TheiPad mini is a defensive move against rivals like Google’sNexus tablet and Amazon’s Kindle, several sources suggest, adding thatApple must act to fend off competition from those two lower priceddevices, which both retail for just $199. How: Whoknows? But Apple has set up an expectation that all of itsmajor product releases will be accompanied by huge showy media events.An iPad mini would fall into that category for sure.